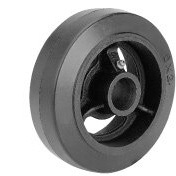 Moldon rubber wheels feature cushion rubber tread vulcanized to a cast iron center with lubrication fitting. Rubber wheels are excellent for floor and load protection. Benefits include easy rolling and quiet operation. Shock absorbing is enhanced with a rubber tread hardness 70-80 Shore (A) Durometer reading. Select the appropriate wheel bearing for optimum mold on rubber wheel operation. Call toll free 1-888-904-9531 for information and to order mold on rubber wheels. NCC-RSR515 5 1-1/2 1-5/8 1-3/16 350 5/8 and 3/4 "
NCC-RSR620-2 3/16 6 2 2-3/16 1-3/16 500 5/8 and 3/4 "
NCC-RSR625-1 3/16 6 2-1/2 2-3/4 1-3/16 600 5/8 and 3/4 "
NCC-RSR625 6 2-1/2 2-3/4 1-15/16 700 1 and 1-1/4 "
NCC-RSR625-3 1/4 6 2-1/2 3-1/4 1-15/16 700 1 and 1-1/4 "
NCC-RSR630 6 3 3-1/4 1-15/16 750 1 and 1-1/4 "
NCC-RSR820-2 3/16 8 2 2-3/16 1-3/16 600 5/8 and 3/4 "
NCC-RSR820 8 2 2-1/4 1-7/16 650 7/8 and 1 "
NCC-RSR825-1 3/16 8 2-1/2 2-3/4 1-3/16 800 5/8 and 3/4 "
NCC-RSR825 8 2-1/2 2-3/4 1-15/16 850 1 and 1-1/4 "
NCC-RSR825-3 1/4 8 2-1/2 3-1/4 1-15/16 850 1 and 1-1/4 "
NCC-RSR830 8 3 3-1/4 1-15/16 900 1 and 1-1/4 "
NCC-RSR920 9 2 2-1/4 1-7/16 600 3/4 and 7/8 and 1 "
NCC-RSR925 9 2-1/2 2-3/4 1-15/16 750 1& 1-1/4 "
NCC-RSR1025-1 3/16 10 2-1/2 2-3/4 1-3/16 900 5/8 and 3/4 "
NCC-RSR1025 10 2-1/2 2-3/4 1-15/16 950 1 and 1-1/4 "
NCC-RSR1025-3 1/4 10 2-1/2 3-1/4 1-15/16 950 1 and 1-1/4 "
NCC-RSR1030 10 3 3-1/4 1-15/16 1000 1 and 1-1/4 "
NCC-RSR1040-1 15/16 10 4 4-1/4 1-15/16 1400 1 and 1-1/4 "
NCC-RSR1040 10 4 4-1/4 2-7/16 1400 1-1/4 and 1-1/2 "
NCC-RSR1220 12 2 2-3/4 1-15/16 800 1 and 1-1/4 "
NCC-RSR1225 12 2-1/2 2-3/4 1-15/16 950 1 and 1-1/4 "
NCC-RSR1225-3 1/4 12 2-1/2 3-1/4 1-15/16 950 1 and 1-1/4 "
NCC-RSR1235 12 3-1/2 4-1/4 2-7/16 1500 1-1/4 and 1-1/2 "
NCC-RSR1240 12 4 4-1/4 2-7/16 1600 1-1/4 and 1-1/2 "
NCC-RSR1250 12 5 5-1/4 2-7/16 2100 1-1/4 and 1-1/2 "
NCC-RSR1425 14 2-1/2 2-3/4 1-15/16 1100 1 and 1-1/4 "
NCC-RSR1430 14 3 3-1/4 1-15/16 1300 1 and 1-1/4 "
NCC-RSR1440 14 4 4-1/4 2-7/16 1900 1-1/4 and 1-1/2 "
NCC-RSR1630 16 3 3-1/4 1-15/16 1500 1 and 1-1/4 "
NCC-RSR1640 16 4 4-1/4 2-7/16 2000 1-1/4 and 1-1/2 "
NCC-RSR1830 18 3 3-1/4 1-15/16 1550 1 and 1-1/4 "
NCC-RSR1835 18 3-1/2 4-1/4 2-7/16 1900 1-1/4 and 1-1/2 "
NCC-RSR2030 20 3 4-1/4 2-7/16 1700 1-1/4 and 1-1/2 "